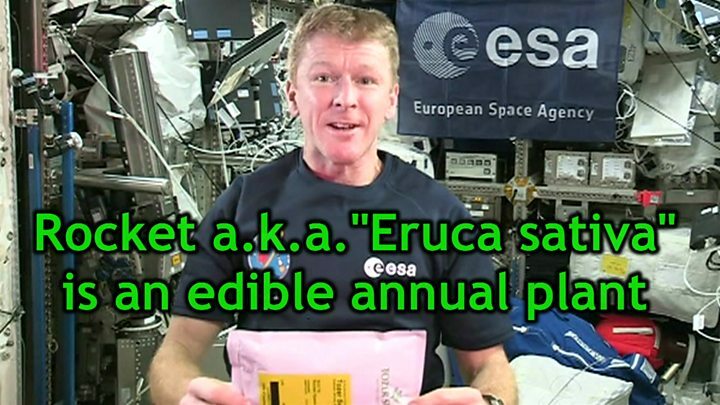 Thousands of schools in the UK will be receiving seeds that have been in space with Tim Peake. The British astronaut has launched a mass experiment to grow the seeds of the salad leaf rocket. They want to compare them with seeds that have not been in space to see if there are any differences. The experiment is being run by the Royal Horticultural Society's campaign for school gardening and the UK Space Agency. The seeds have been in space for six months and were returned to Earth in March by the former commander of the space station, Scott Kelly. They have been carefully sorted and packed into packets which are on their way to the 8,500 schools, children's clubs and societies that have signed up for the experiment. The aim is to learn more about the effects of weightlessness and radiation on seeds in order to develop plant varieties that can be grown on long space missions. Image caption Each school will receive a red and blue packet. One of them contains seeds that have been in space. The results will give scientists valuable information, according to Dr Libby Jackson of the UK Space Agency. "Should we ever want to send astronauts back to the Moon or on to Mars they will need fresh food. At the moment astronaut food is freeze dried and not very exciting. We would like to have astronauts growing their own food. It would be healthier, psychologically better for them and it would mean that they would not need to take so much with them". The pupils of Walton School in Stafford are among the first to receive the seeds. According to the head teacher, Neil Finlay, the children have been "buzzing". "There has been a huge reaction. The children have been so positive about the entire process. It's been the talk of the school for the past couple of weeks. They are really looking forward to planting the seeds". One of the school's physics teachers Sunil Lal says that his students have already begun to come up with imaginative theories about how the seeds might be affected by being in space. "We have had some fantastic ideas," he told BBC News. "One is that the stem will grow downwards rather than up because of the effects of gravity on the seeds themselves. "We've also had ideas from students that the plants may not be as nutritious because of the radiation in space". The children will have their results in five weeks' time. Whatever they find, the experiment is already firing their imagination and perhaps inspiring them to one day follow in Tim Peake's footsteps.